The time of normal ceramic mugs with all kind of fun prints on them is over. Now there is a mug you can build on and I really mean that. So now you can use all your fun bricks to make you mug look fun or maybe even give it wheels so that it can drive around you desk. I can only imagine how much fun a mug like this is and how limitless the options are to make something amazing. 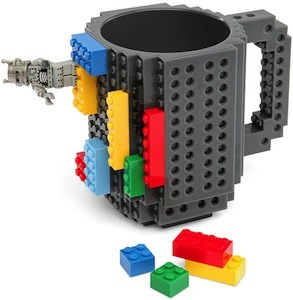 Get planning and start by ordering your Build-On Brick Mug.